Q What are the differences between the choices of accommodation? A Dominik Panzió is a basic hostel, rooms share a bathroom. They have party room and breakfast is included. Q Where are we going to run and what are the trail signs used? Q What sort of beer do you have there? A Hungary makes good basic beer of all types, even fruit flavours. We get plenty of beer from the nearby great beer countries like Czech, Slovakian and Austrian/German. Unfortunately there is also plenty of Heineken available. We have a local microbrewery sponsoring us so there will be some of their lovely stuff on offer. Q What are the local special drinks? A Unicum - a dark bitter herbal drink much loved by the locals, but an acquired taste. The plumb variety is particularly good. 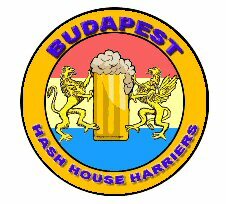 Q When do the bars shut in Budapest? A The Lions Hotel bar seems to shut very early, and it is far too expensive to drink there anyway. In the city plenty of places are open late or don`t close. Theoretically drinking on the street in pubic is not allowed, but our circles have never been affected (so far), unless you look homeless there is no problem drinking anywhere.